Providing you the best range of semi conducting black crepe paper, multi ply bitumen foil paper, bitumen sandwich paper and bitumen coated paper with effective & timely delivery. 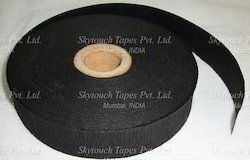 Semi conducting black crepe paper is used by transformer industries as well as cable covering industries. The main use of this material is to ground the leakage of current. Availability: Available in roll form of maximum width of 20” or in slit widths. Multi Ply Laminated Bitumen / Foil / Paper layers or as required to make the laminate strong and waterproof. Bitumen Sandwich Type Paper available in various combinations of layers of Bitumen and Papers.